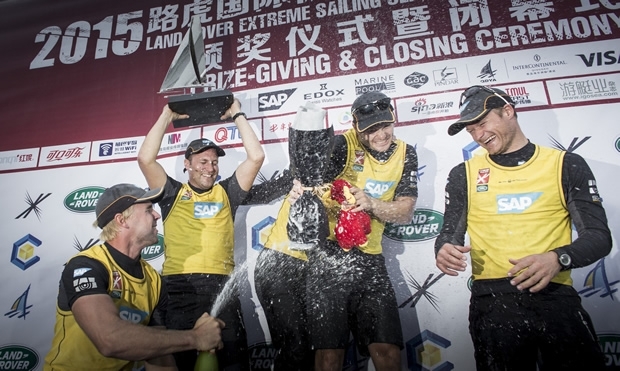 The Land Rover Extreme Sailing Series racing in Qingdao saw SAP Extreme Sailing Team claim its first ever event win – and just for good measure, they scooped the Land Rover Above and Beyond Award for their outstanding performance as a team in China. After two days of racing in dense fog, Danish co-skippers Jes Gram-Hansen and Rasmus Køstner were dominating in Qingdao, leaving them with a 23-point lead going into the final day. However, Qingdao was not going to let the Danes run away with the lead that easily. For the grand finale, blue skies and a 180° wind shift greeted the teams, blowing from the north and shooting bullets of breeze ranging from 3-20 knots, through the city skyline and hitting the race course at unpredictable angles. The change in conditions looked to have set the leaders off their pace, but the Danes were able to capitalise on their outstanding performance over the first three days of racing – that included 14 podiums and five wins – to keep the chasing pack at bay. In the chasing pack, the battle was on for the remaining podium positions, between The Wave, Muscat and Gazprom Team Russia, with the deciding moment only coming in the final race. Needing to keep a four-boat gap on leaders SAP Extreme Sailing Team, the young Russians had the overall win in their reach, but a penalty at the windward mark cost them not only the event but second place too. Phil Robertson, Igor Lisovenko and the team were forced to settle for third place – their first podium position since joining the circuit. A win in the final double point race left the Leigh McMillan-steered The Wave, Muscat second overall, with Red Bull Sailing Team finishing fourth, causing a shake-up in the overall Series leaderboard – SAP Extreme Sailing Team now edging ahead on 28 points, The Wave, Muscat in second on 27 and Red Bull Sailing Team in third, with 25. The 2015 Extreme Sailing Series now heads for Cardiff presented by Land Rover, being held over 18-21-June. 1st SAP Extreme Sailing Team (DEN) Jes Gram-Hansen, Rasmus Køstner, Thierry Douillard, Mads Emil Stephensen, Brad Farrand 178 points. 2nd The Wave, Muscat (OMA) Leigh McMillan, Sarah Ayton, Pete Greenhalgh, Ed Smyth, Nasser Al Mashari 166 points. 3rd Gazprom Team Russia (RUS) Igor Lisovenko, Phil Robertson, Garth Ellingham, Alexander Bozhko, Aleksey Kulakov 162 points. 4th Red Bull Sailing Team (AUT) Hans Peter Steinacher, Jason Waterhouse, Josh McKnight, Shaun Mason, Stewart Dodson 156 points. 5th Team Turx powered by Kaya Ropes (TUR) Edhem Dirvana, Mitch Booth, Selim Kakış, Pedro Andrade, Brock Callen 137 points. 6th Oman Air (OMA) Stevie Morrison, Nic Asher, Ted Hackney, Ed Powys, Ali Al Balashi 115 points. 7th GAC Pindar (GBR) Seve Jarvin, Jack Macartney, Marcus Ashley-Jones, Tyson Lamond, James Wierzbowski 109 points. 8th Team Extreme Qingdao (CHN) Jonas Warrer, Cheng Ying Kit, Aaron Cooper, Liu Ming, Kong Chengcheng 104 points. 9th Lino Sonego Team Italia (ITA) Lorenzo Bressani, Enrico Zennaro, Andrea Tesei, Tom Buggy, Stefano Rizzi 104 points. 1st SAP Extreme Sailing Team (DEN) 28 points. 2nd The Wave, Muscat (OMA) 27 points. 3rd Red Bull Sailing Team (AUT) 25 points. 4th Gazprom Team Russia (RUS) 18 points. 5th Oman Air (OMA) 18 points. 6th Team Turx powered by Kaya Ropes (TUR) 15 points. 7th GAC Pindar (AUS) 14 points.